Posted on September 26th, 2018. When one thinks of eating in the Caribbean, the mind immediately conjures up visions and flavours of Jerk Chicken, Blackened Fish and Rice ‘N’ Beans – all delicious in their own right. 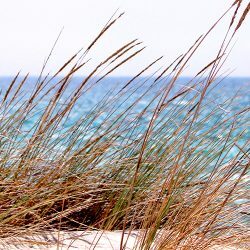 But more and more islands are seeing the need to expand their menus to suit the varying palates which are now so prevalent in our changing world. 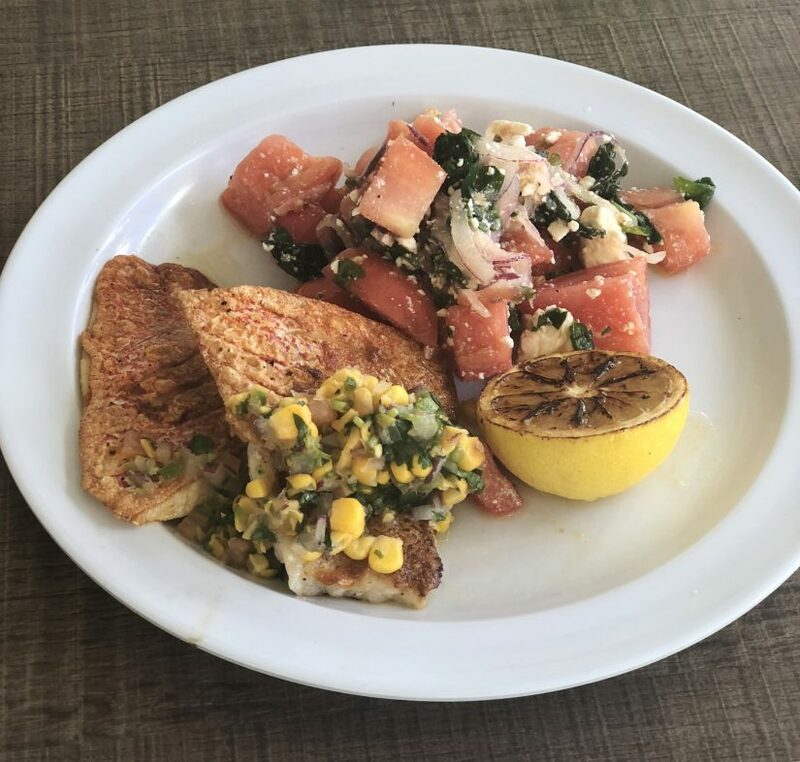 On our most recent trip to the beautiful island of Grand Cayman, Niamh and I discovered a couple of “alternative” Grand Cayman restaurants, serving up ultra-healthy vegan and vegetarian dishes with one offering sustainable seafood with a difference. After our long flight from Europe on Saturday, our first night was a quiet night in, settling into our beautiful beachfront villa at The Caribbean Club. We had dinner at LUCA, one of the Caribbean Club’s top restaurants in Grand Cayman which was located onsite. 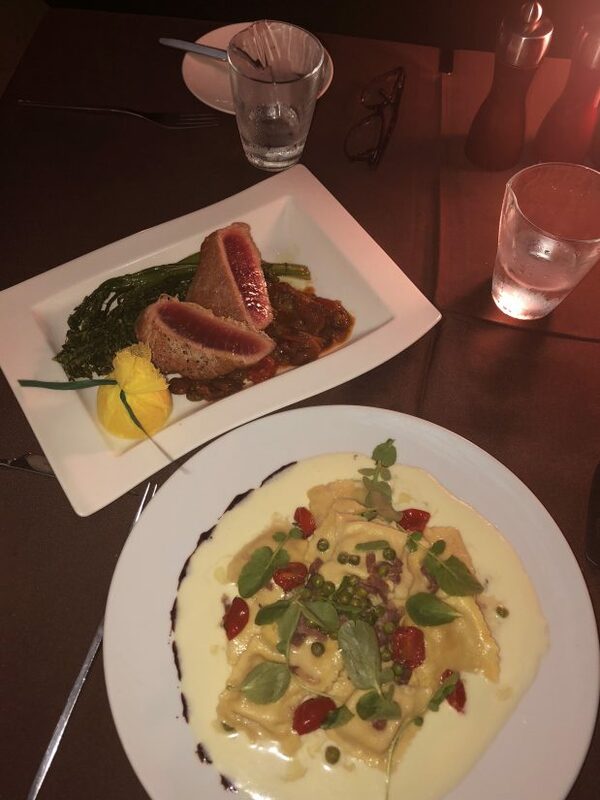 With a table outside on the patio, we enjoyed a spectacular sunset and savoured our dishes of seared tuna with Sicilian sauce and Tortellini Special. Pasta at LUCA is handmade and excellent. Whilst Sunday brunch at LUCA is an institution on Seven Mile Beach, we had to miss it with much to see and do on the island before a week of inspecting our Grand Cayman Villas. The day began with a Jetski Safari, one of the many fun things to do in Grand Cayman, with stops at amazing snorkelling sites where we saw shoals of multicoloured tropical fish, squid and even a barracuda. I would highly recommend this fun trip, lasting approximately 1.5 hours. 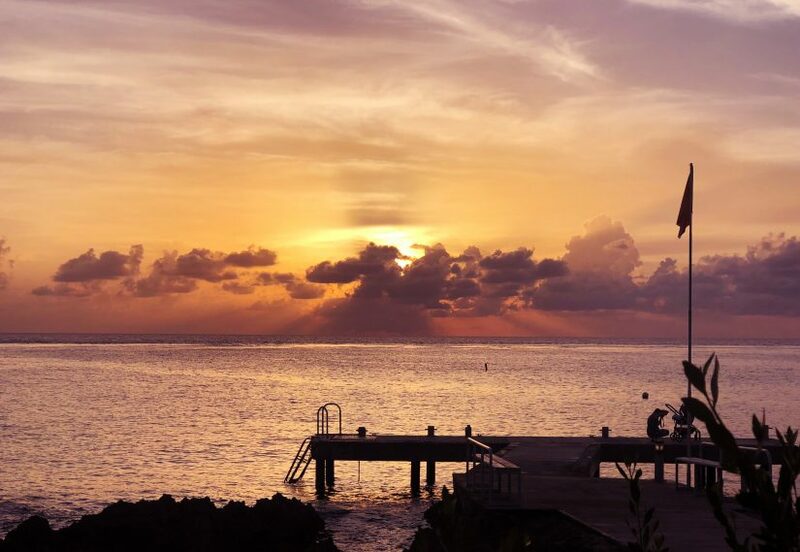 For more information on these great activities read our Cayman island activity guide. We took a leisurely drive up to the North Side of the Island for our visit to The Crystal Caves, a relatively new attraction, with an interesting guided walking tour through the tropical forest and underground caves. A must for cave buffs. 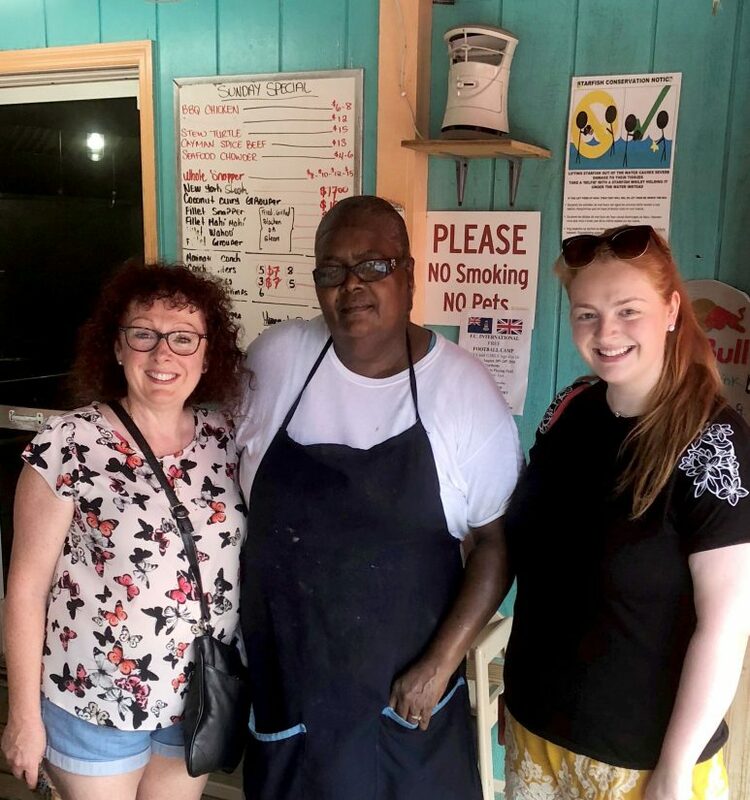 A stay in the Caribbean must always include a visit to a Fish Fry Shack and/or an open-air roadside restaurant so we made our way to The Caboose, just a couple of minutes drive from the Caves. We shared delicious Coconut Shrimp with Caesar Salad and blackened Mahi Mahi served with rice ‘N’ beans, potato salad, plantain and vegetables. This is traditional Caribbean home cooking at it’s best and the cook Blossom was happy to pose for a photo with us. We spent the rest of the afternoon driving around the island, enjoying the leisurely pace with a quick trip to Hell for photos. After our adventurous day, we popped across the road from The Caribbean Club to Casa 43, a wonderful Mexican restaurant, owned by one of the top chefs on Grand Cayman. 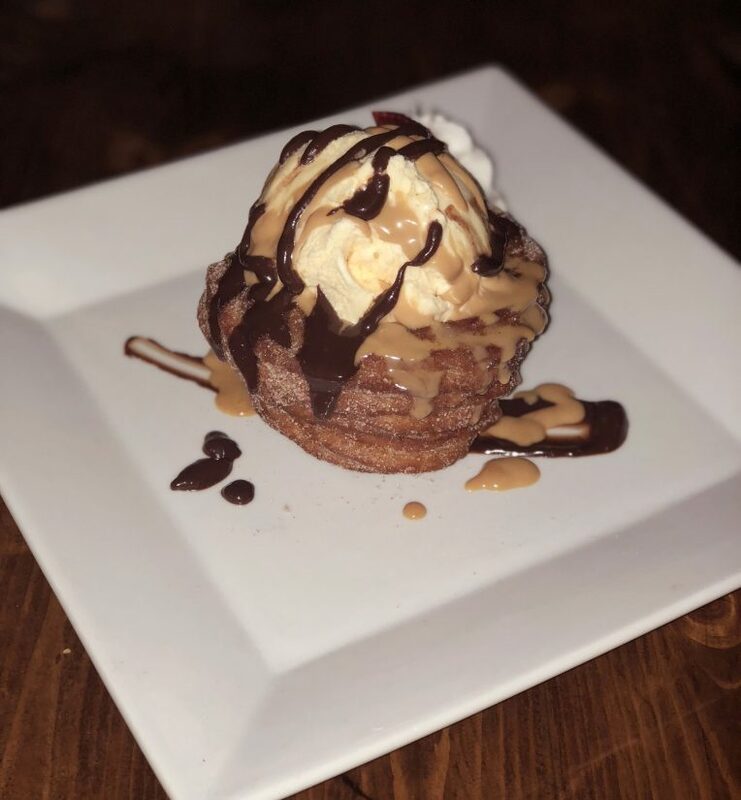 We had a wonderful dinner here, with a taster plate of different Guacamoles, Fajitas and the one of the naughtiest but nicest desserts either of us have ever had – a crunchy Churro Basket, filled with ice-cream and drizzled with caramel sauce. Monday was spent with property inspections around the Seven Mile Beach area and for a quick lunch we found a healthy food heaven in the form of Island Naturals Café, offering vegetarian, vegan and gluten-free options. This cafe literally screams fresh and clean eating. We loved our healthy black bean and avocado wrap and falafel salad bowl as we overlooking the ocean. 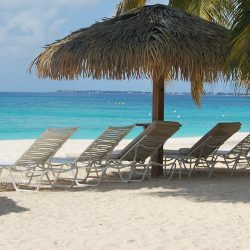 Seven Mile Beach is one of the best Cayman island beaches. For dinner that evening, we had booked the Beach BBQ at Rum Point and took a 40 minute Catamaran Sail across the North Sound to get there. This was a lovely way to spend an evening. The food was bountiful and delicious with the usual BBQ dishes on offer including Jerk Pork, blackened fish, BBQ’d steak and chicken, rice ‘n’ beans, salads, breads, pineapple upside down cake and fresh fruit. The sail back to Seven Mile Beach was entertaining with lightning shows lighting up the night skies all around us. 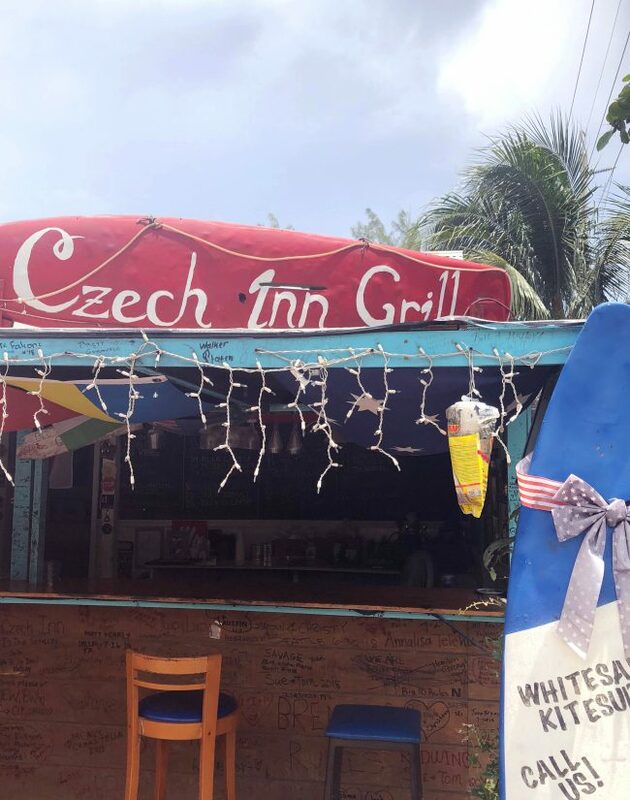 We spent most of the following rainy Tuesday inspecting properties in the East End area of the island and enjoyed lunch at The Czech Inn at Bodden Town, an interesting roadside open-air restaurant in Grand Cayman. The menu is extensive and there’s something to suit all tastes. The Schnitzel was as good as the same memorable dish I had in Vienna many moons ago and Niamh declared her BBQ ribs to be the best she’d ever eaten. We had a lot of work to catch-up on that evening so for dinner we opted for room service at The Caribbean Club and enjoyed our LUCA salads with grilled fresher than fresh Mahi Mahi. 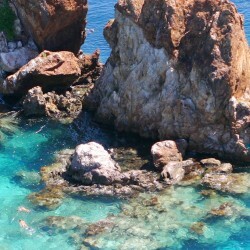 A very warm Wednesday was spent on the North Side and Rum Point areas, again inspecting our spectacular properties. We enjoyed a wonderful lunch at Kaibo Yacht Club, overlooking North Sound. We both enjoyed grilled Catch of The Day with salad. Before starting our afternoon inspections, we made a fleeting stop at Starfish Point to marvel at the beautiful starfish residing in the crystal clear waters all year round. We took a trip to the vibrant Camana Bay for dinner that evening and visited one of my favourite restaurants – Agua. 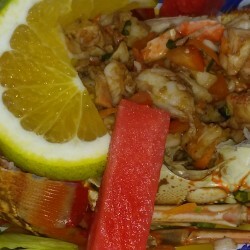 Here is a popular lively restaurant which attracts a hip crowd and the food is pretty amazing. To begin, our Ceci Fried Cauliflower and Agua House Salads were to be savoured. And for main course, we enjoyed the Lobster Ravioli and Grilled Catch of The Day. All dishes were fresh, light, bursting with flavours and wonderful textures. 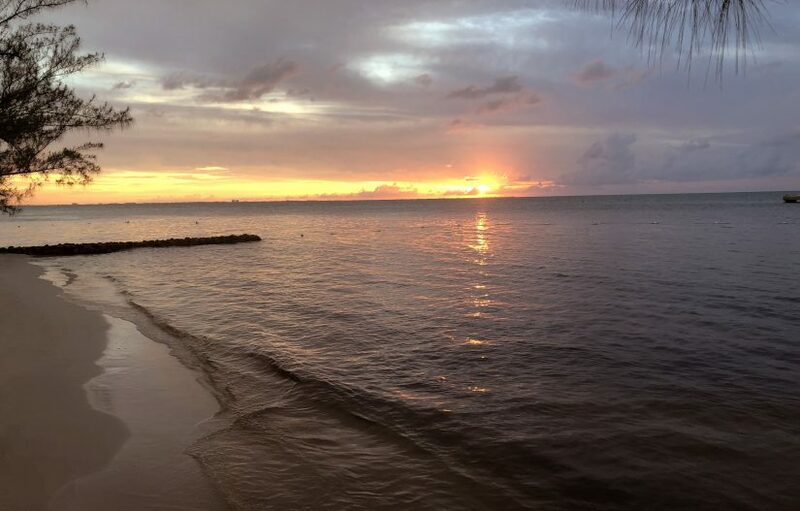 Thursday was a day for more villa inspections in the Seven Mile Beach, one of the best Caribbean Beaches, and West Bay areas. We made a pit-stop for lunch again at the Islands Natural Café and enjoyed falafel wraps bursting with salad, avocado and jalapenos. We shared a slice of their award-winning vegan Mango Cheesecake and it will difficult to relive such a delicious healthy sweet treat until our next trip to Grand Cayman. We had read about a new “vibrant alternative” restaurant, recently opened at Lighthouse Point, overlooking the ocean on West Bay. 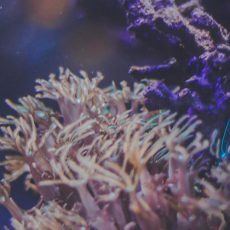 We were intrigued by their eco-friendly, mostly vegan menu and their use of lionfish, a newly-introduced (by humans) invasive fish with no natural predators, and causing huge disruption to the tropical reefs around the island. On arrival we enjoyed a pre-dinner cocktail while taking in the last rays of a spectacular sunset. 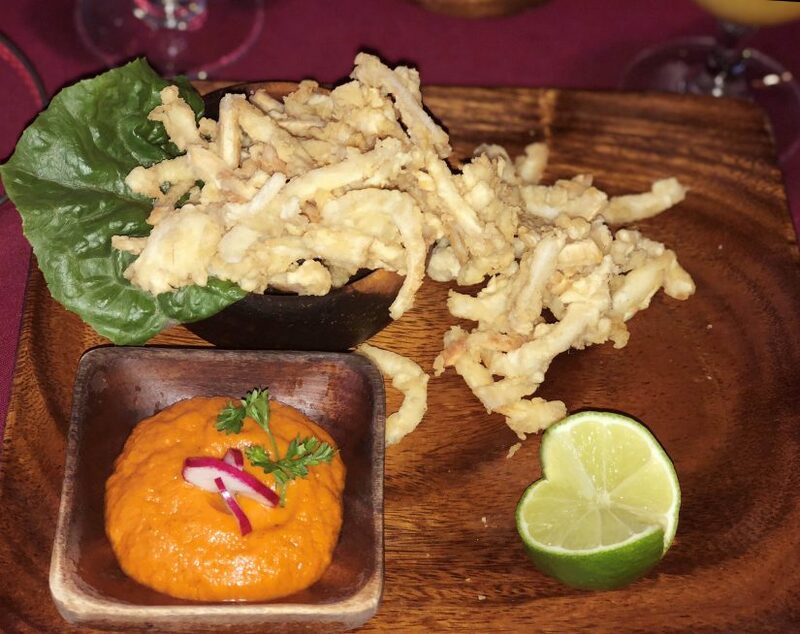 We chose vegan dishes to begin – Coconut “Calamari” and a refreshing Coconut Ceviche. Impossible as it may sound, you couldn’t possibly tell that the Calamari dish wasn’t the real thing. It was cooked to perfection, tender with a slight bite and a delicious coating. The Lionfish Curry to follow was sublime. Lionfish is not a fish either of us had ever seen on a menu before and knowing of the reason they serve it here, there was an element of the “feel-good” factor when ordering it. In fact everything about this lovely little restaurant in Grand Cayman felt good. Lionfish is a white fish with a mild flavour and flaky in texture, but with a bite. 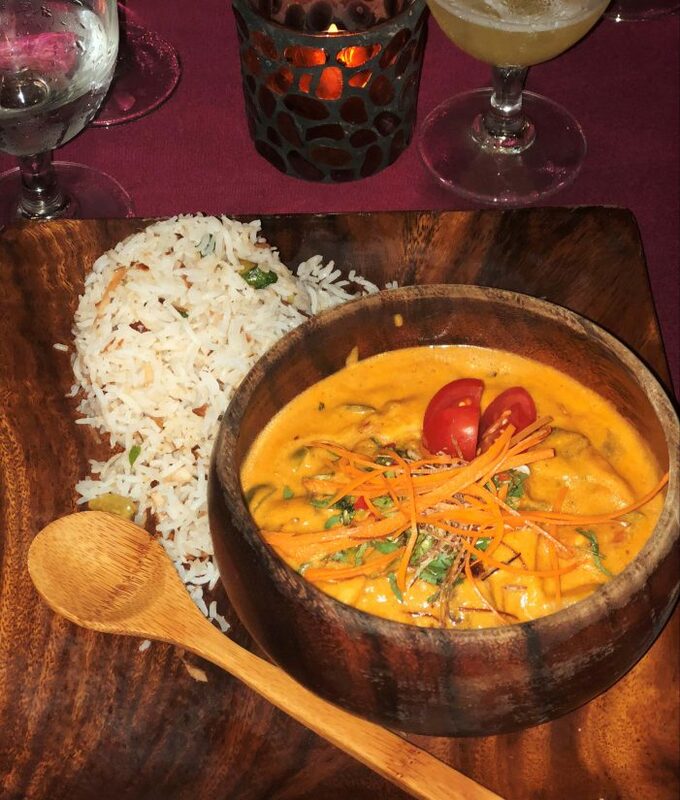 Light Basmati Rice bursting with flavours of the East accompanied the dish. We couldn’t find room for any of their healthy desserts unfortunately. VIVO is a restaurant we both loved and certainly hope to revisit on our next trip to Grand Cayman. 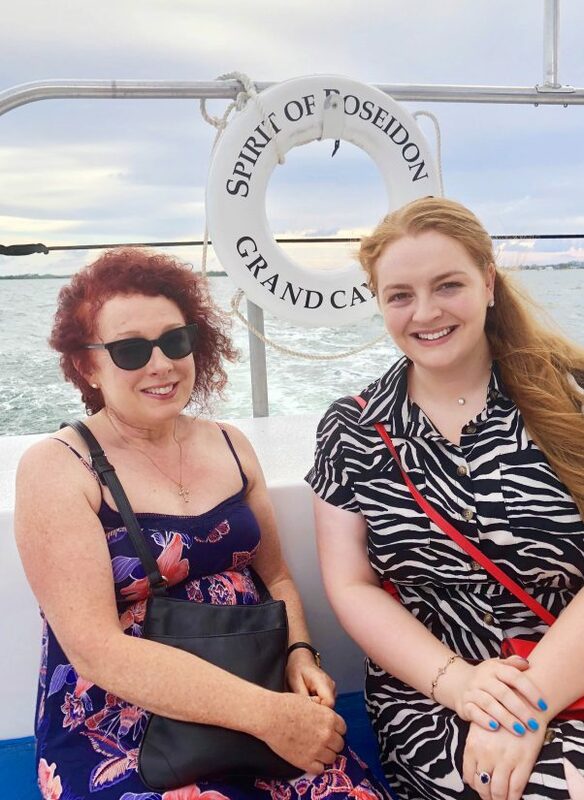 Overall our trip to this captivating Island included some of the best restaurants in Grand Cayman, and we hope to visit them again in the next coming years.